She was a classmate of me in the university, wouldn't call her a friend, just another nice person. We lost contact after the university, met again two years ago accidentely. We talked some and turned out we are both playing WoW and also that we both left the capital city and now living in adjacent smaller cities. We kept in loose contact, 1-2 mails a month. Saturday late evening she called me to help her pack her stuff and leave her flat. From her voice it was no wonder that it's an unscheduled flat change. Since I'm not famous for being selfless, I told that she either pays the same money a taxi driver would ask for a Saturday evening stuff transport or she tells me the whole story. She choose to tell the story. It was quite a story. She started to have headache a month ago. She was often tired without reason, was sad more and more often. While her husband and friends said it's too much work, strangely the symptoms were stronger on weekends. While she used to play WoW a lot, she played less and less, though it wasn't a surprise to anyone, since with the expansion coming there were no more raids. However the husband noticed that instead of collecting DPS gear to her holy paladin for faster leveling she did dailies with her warlock. She was often sad, tired and had headache but it was under control. Than the Lich King came online, and her health started to collapse. They both took payed holiday for the Nov 13-20 period. Her headache increased so she could barely play, but the doctor found no problems and she also agreed that she felt better at the doctor's. They switched monitor with her husband, hoping it's an eye-issue but did not help. His husband was more and more upset with his wife-issues slowing him down from reaching lvl80 fast. By friday she was nearly invalid. Slept like 14 hours, could eat only a little, noticed that she lost 3 kg in the last weeks, her headache was stronger and stronger. The doctor sent her to a psychiatrist. She talked a lot about her past few years, in carrier, personal life, WoW-play. It turned out that she left the capital city and her job there because his husband got a good job in the small city. She found a job here but didn't really liked it. She missed the big city too. "In life we have to make compromises" she told me about it a year ago. Since there were no changes in work or city in the last weeks, the doctor quickly found that here recent collapse is WoW-related. 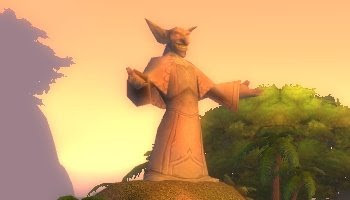 Luckily the doctor was not a dr Phil-like charlatan and was capable to understand that in WoW we play with real people and not with computer-created beings. And after all, she played little WoW compared to the previous months, so it couldn't be game addiction. So he started to ask about her WoW life. She was playing since the beta, her husband started later. She played warlock since the start, she found the imps funny and also the dot-and-run tactics fit her very much. It was her husband who started raiding first, she followed him soon and liked it. After some Kara they both noticed that their current social guild is not going to down Prince or the dragons, so they applied together to a T5 guild this March. Her husband's tank was very welcommed, so they took them both. However her position in the raids was very sporadic. When they had open spots in farmraids she could go, otherwise not. She more or less understood it since there were other warlocks, in much better gear (since she rarely could go, she couldn't catch up on gear). As everywhere, there was a tank-healer shortage, so she was persuaded to start a healer. Her husband respecced fury to boost her up through instances. She really did not liked the "5 Wailing Caverns in a row" runs. She reached lvl 70 in late June. They could afford to gear her up from BoE, BS-Engi, and her paladin was welcommed in raids, they downed RoS before 3.0.2. She loved raiding, but did not liked spamming FoL. Outside of raids she rather farmed with her warlock. With 3.0.2 they stopped raiding. She told that she understood that the better geared warlocks went to raid but at 80 all warlocks will be equally geared, so she want equal share of raids with her warlock. They rejected it, told her to stick to her pally since they needed a healer. After the story was told, the psychiatrist asked some directed questions to make her notice that even in a game she is making compromises, she ignores her own wishes and does what is told to her. She also noticed that his husband does not support her choices, although as main tank and officer he could do something for her. She went home and told her husband: "I gquit now, and find a guild that accept me the way I want to play, as a warlock. I left the capital, left my job for you, now it's your turn, come with me to a new guild. If you refuse to make a compromise for me even in a game, I file a divorce!" From the fact that we packed stuff Saturday evening you can guess he gave the wrong answer. The moral of the story for me: WoW is a simulated world with real people. What is not directly game mechanics related like spell rotations and gear stats, are just as real as the life. Since here the things happen much faster, you can see results in weeks what you would see in years in real life. If she wouldn't play WoW she may never divorce from a husband who did not supported her, would spend her life in a job she did not like and live in a city she definitely disliked. Now she move not just an animated character to a different server, but also her very real self back to the capital city. - Dear people, you did not gave me a fair share of raiding as the other warlocks had. I accepted it since I was undergeared. You did not want to give me the fair share on lvl80 although there will be no gear reasons for that. 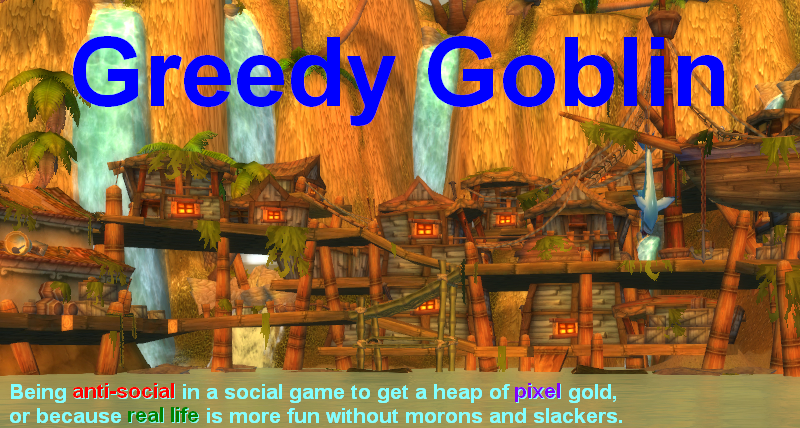 So I leave the guild and find one where I get my fair share. - However I pulled a paladin, just for you. I never liked it, you wanted an extra healer. I have 6 days 11 hours /played, that's 155 hours. In an hour I could make 150G with dailies. That's 23250G. So for the first time, you going to give me what I deserve. She removed this amount from the guild bank and left the guild. And she giggled. For the first time this month. Wow, that's some story. You're a good storyteller and I think you're dead right about how her problems in her marriage in the real world were reflected in the game. About helping herself to a salary from the guild bank: Even though it's understandable I really can't approve of it. Stealing is stealing, even though you may think your cause justifies it. She could have sent them an invoice, asking for the gold, making a statement of how she felt she had been treated. But just taking it from the bank... It isn't fair. I can hardly believe that every single one in her guild had a part in the decision not to let her raid as a warlock. She stole from innocent as well as from the bad guys. Anyway: I really hope she's better off soon, restarting at new server and in new town. And it's great that she's got supporting friends as you. LMAO! What a way to quit! I'd have to agree with Larisa on this one. Not a good thing to do taking the money and the logic behind the total hours is somewhat flawed in my opinion. Not saying that it isn't exactly fair, but probably still not right. One could argue that getting a divorce over a game is a rather stupid reason, but hopefully those that read this see that there's more too it that that. Obviously he wasn't treating her fairly in their marriage. Might be reading something into it, but sounds like in his mind she was there to support him in game (and probably RL), but it wasn't reciprocated. Kudos to her for sticking up for herself! While I certainly sympathize with your friend's situation as far as her WoW-addicted husband is concerned, I don't understand why she felt it was unfair to be excluded from raids on her warlock, much less why it was fair to recoup lost opportunity costs by stealing gold from the guild bank. Too often, what people describe as "unfair" is really just a thwarted sense of entitlement. Your friend felt that she was entitled to raid on her warlock. Why? She made the choice to join a raiding guild that was full on raiding warlocks. The guild offered her the opportunity to raid if she rerolled a healing class, which she did. She was invited to raids and, by your account, had fun -- not as much fun as she would have had on her warlock, perhaps, but both she and the guild lived up to their respective ends of the bargain. Along comes WotLK and a gear reset the likes of which we haven't seen since ... well ... The Burning Crusade! The guild is still full on warlocks and still short on healers. She asks to raid as a warlock anyway, which means that the guild will (1) have to recruit another healer and (2) ask one of its more senior warlocks (who has been in the guild longer, and presumably done more to elevate it to its pre-WotLK level of progression) to sit out so she can sub in. Suddenly, what your friend percieves her "fair share" is taking away from someone else's "fair share." She made the choice to join a guild that didn't have a raid spot for her. She made the choice to reroll another class. She even made the choice to move to another town and take another job to further her husband's career. She has every right to regret those choices, and take decisive action to correct them, but she doesn't have the right to steal from others and call it "fair." I'm also unsure if "fair" is the proper word here. She had serious mental health problems because of her threatment both by her husband and her guild (=friends). To prove that she can hit back, she is not weak helped her a lot. I understand that lot of people would not do what she did, just left. However I have to add that she applied to this guild with his husband and were accepted. They knew she was a warlock and knew her gear. There was no different "raider" and "social" ranks. They could reject her if they did not need a warlock. Yet they accepted her (to have her tank husband) but did not took her to raid. Far from being fair. I enjoyed your story and read it to my wife. Thanks for a great anecdote! In the spirit of this just being a game I will say that if there was nothing wrong with the guild treating her the way they did because it was just a game then there is nothing wrong with her taking the gold because it is just a game. If a guild is truly a team then taking her wants into consideration shouldn’t have been an issue. IF it was they should have said so and said heal or leave. At which point she should have just left. I’m glad for her because it sounds like she finally reached her breaking point. Often time’s people need to get there before they can rebuild themselves into stronger people, in the end if it cost her x amount of hours and a weak husband to finally grow as a person into a strong individual then she should count her blessings that that is all it cost her. There are people who endure much more to reach that breaking point. Quitting a guild because you're not enjoying the game? Justified. Quitting a guild because you're not enjoying the game, and taking 24,000 gold out of a guild bank that was likely the combined effort of every major raider involved? Not even remotely justified. In the real world, we call that embezzlement, and there would be jail time involved. It's good that she has supportive friends. It's good that she is enjoying the game now. But if either of you believe that she can claim that much scratch from the guild bank and still claim the moral high ground, you both have some lessons to learn about life. I am 45 years old and had my share of conflicts in life. I still cary 10-12 unfair treatments with me that I never settled. Some of those are 25 years old and I remember them still. I NEVER regretted any of the conflicts where I got my revenge. I dont think it is a question of fair or unfair. Don't get mad, get even !